There are plenty of excellent people working in all parts of the beer industry. And, in the opinion of the inhabitants of Crafty Towers, one of the most excellent is the man variously known as Dreamy Steve, "The tall, good looking one?" (Mrs Pint), Steve Finney or, thanks to this beer, Finn Diesel. Many of the things you'll have seen from Feral in the past few years, mainly the non-liquid things – rebranding, events and the like – have had Dreamy's fingerprints all over them after he joined the WA team from Little Creatures. At the end of this month, he's moving on to a new role (apparently so he has more time with his young family, but we're pretty sure it's so he can spend more time surfing). And Finn Diesel is his parting gift. He's being waved off into the sunset with an IPA (and a station wagon stuffed with hops, if the label is anything to go by). 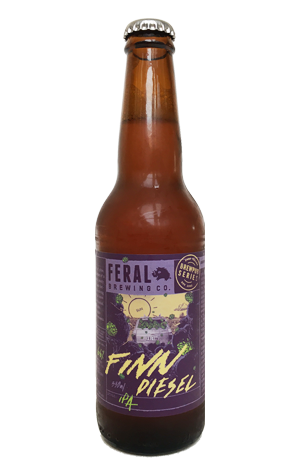 We're all well aware Feral knows its way around an IPA, be that straight, double, red, white, black, barrel fermented or sour, and here they've put a new form of hops – lupulin powder – to use. Essentially an extract of the best bits of hops, here both Simcoe and Citra are sent into battle and, while the label says "pine, perfume and citrus", it comes across as the most tropical of Feral's IPAs to date. Those aromas are joined by a creamy biscuit character from the malts that lend it its copper colour, while under its marvellous head you'll find a full bodied beer with heaps of slightly resinous, ultimately bitey and, dare we say it, diesel like hop flavours. It goes down a treat too. Just like its namesake. Bon voyage, Dreamy!